Thousands of Ultimate Nutrition Members' have 'tried and tested' the Ultimate Nurtition products since the 1970's and continue to use Ultimate Nutrition to this day, 40 years on. Thousands of Ultimate Nutrition Members' have 'tried and tested' the Ultimate Nutrition products since the 1970's and continue to use Ultimate Nutrition to this day. Ultimate Nutrition have provided over 40 years knowledge, advice, and quality products to sportspeople & bodybuilders worldwide. Thousands of Ultimate Nutrition Members' have 'tried and tested' the Ultimate Nurtition products since the 1970's and continue to build stamina & energy with Ultimate Nutrition products to this day, 40 years on. Thousands of Ultimate Nutrition Members' have 'tried and tested' the Ultimate Nurtition products since the 1970's and continue to build strength with Ultimate Nutrition products to this day, 40 years on. Thousands of Ultimate Nutrition Members' have 'tried and tested' the Ultimate Nurtition products since the 1970's and continue to build quality muscle and become winners with the Ultimate Nutrition brand to this day, 40 years on. Thousands of Ultimate Nutrition Members' have 'tried and tested' the Ultimate Nurtition products since the 1970's and continue to build endurance ability with Ultimate Nutrition products to this day, 40 years on. 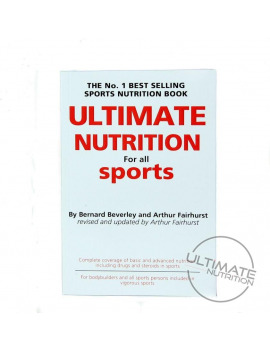 Ultimate Nutrition, established since 1978, with the launch of The Book 'Ultimate Nutrition for All Sports', written by Arthur Fairhurst & Bernard Beverley, known by bodybuilders and sports people as 'The Bible'. The current, revised edition of the book is available and is on offer. Thank you for letting Ultimate Nutrition know that you are feeling the benefits on your knee by taking the Pure Marine Collagen. Much appreciated. There's not a lot of free today... Want to increase your weight?